Universities need to consider inviting and involving students more in their deliberations on higher education issues, according to the Minister of Higher Education and Training, Ms Naledi Pandor, MP. She made this suggestion while delivering a keynote address at the two-day Universities South Africa – Association of Commonwealth Universities (USAf-ACU) symposium that was held at the University of Johannesburg last week. The meeting was held to deepen a sector-wide conversation on Developing the Capacity of Early Researchers. She said as part of moulding students into responsible future professionals, “we also need to look at inherent features such as students’ writing ability and ability to engage with respect and a will to listen to opposing ideas and views.” The Minister said this matter was so close to her heart that she foresaw continuing to contribute personally to a range of deliberations with young people in future, “even when I am no more in a position of influence… I do hope that the questions I posed to the student leadership I met with, yesterday, did sink in,” she said as she concluded this part of her address. 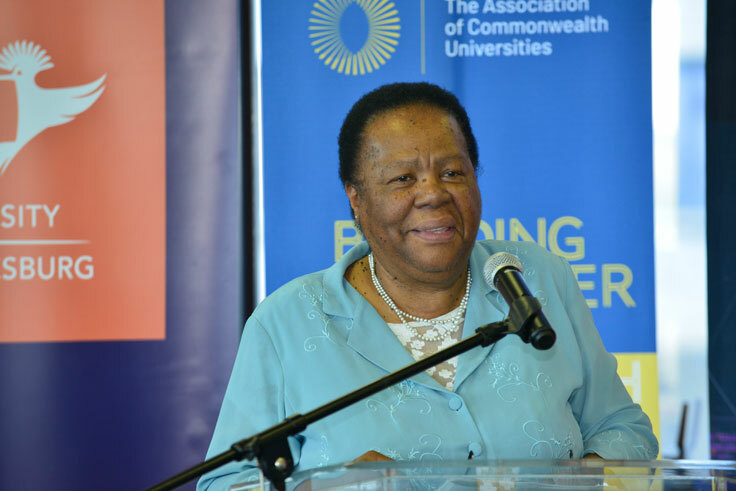 “The challenges confronting doctoral candidates call for a radical rethink in government’s funding policy to close the gaps in funding towards doctoral training,” the Minister of Higher Education and Training, Ms Naledi Pandor, told the 70-strong gathering. On the symposium theme, Minister Pandor said even though South Africa’s higher education system had seen a steady growth in research output (that stood at 9,000 peer-reviewed articles a decade ago and had more than doubled to 22,000 currently), the sector was doing well to pay attention to increasing the number of PhD graduates to not only bolster supervisory capacity, but also to increase equity and diversity in the system. She acknowledged that notwithstanding the numerous support interventions funded by her department (DHET) and the Department of Science and Technology (DST), findings of a 2015 post-graduate pipeline study undertaken by Prof Johann Mouton of Stellenbosch University had uncovered numerous gaps which called for a radical rethink in government’s funding policy. On the question of why so few doctoral students enrolled and went on to graduate, the study had found that most doctoral students worked while they studied to earn an income to support their families as bursaries did not allow full-time study. “Interestingly more natural science than social science students study full-time and more natural scientists than social scientists graduate,” said Minister Pandor. She added that ultimately, the system must gear up to nurture students in post-graduate education from honours level right through to completing PhDs and appointments into academic professions. As she reiterated her case for building a new generation of academics, the Minister of Higher Education and Training said the sector needed to pay serious attention to strategies in place for a) attracting new talent into academia and b) developing pathways for career progression to professorship while seriously interrogating systemic blockages to the promotion of blacks to the rank of Professor. She also invited universities to rethink an emerging trend to outsource and casualise the academic profession by replacing permanence of tenure with hourly pay. “I know this is a global development, but our universities don’t have to follow the global trend.” She said the implications of casualisation of the academic profession were dire for the transformation of the academic workforce, and for the achievement of equity. A partial view of the 70-strong delegation of attendees comprising vice-chancellors, deputy vice-chancellors: research and senior directors and managers responsible for developing, promoting and maintaining the research enterprise at their institutions. Also in attendance were four officials from the ACU; scholars from SA’s and Zimbabwe’s universities who had directly benefitted from ACU support programmes; three officials from the DHET’s University Branch and three from the National Research Foundation. This two-day symposium, co-hosted by Universities South Africa and the Association of Commonwealth Universities, was continuing a discussion on emerging researchers, that dated back a few years and which peaked at USAf’s biennial Research and Innovation (R&I) Dialogue of 2018. The emerging researchers’ discourse was further fuelled from 2018 by findings of a year-long study completed in 2017, which looked at a) the research profile of lecturers and senior lecturers within the university system; b) key research drivers within South Africa’s public university system and c) key enablers for, and impediments to building a pipeline of emerging researchers. That study also recommended strategic actions to undertake at the systemic, institutional and individual levels to increase the number, diversity and representation of emerging researchers in the university system. At the R&I Dialogue of 2018, it was agreed that the question of emerging researchers warranted a more dedicated forum for more in-depth exploration, hence the symposium of 18-19 March, 2019. 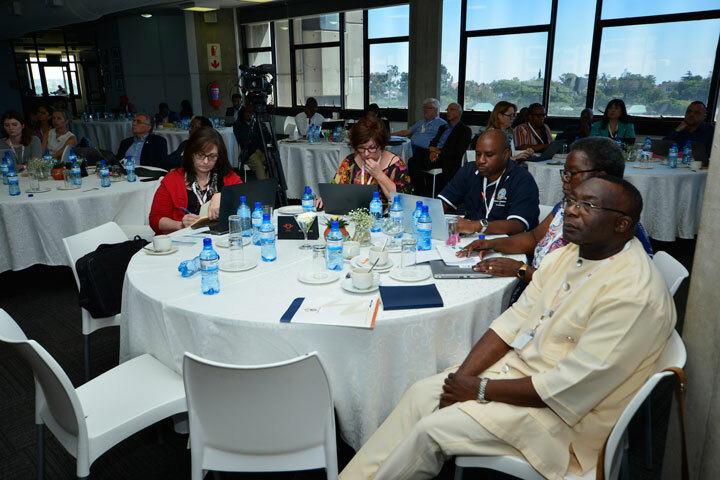 Deliberations at the event covered numerous areas, namely, a) the importance of supporting emerging researchers; building a cadre of emerging scholars for South Africa’s higher education; challenges they face and support programmes available to them from the ACU and South Africa. The ACU has a proven track record of working with its members to support the development of early career researchers at both individual and institutional level. In South Africa, in addition to support interventions offered by the DHET and DST, numerous universities also offer dedicated training programmes in support of post-graduate students for their success. The USAf-ACU symposium aimed to achieve agreement on new interventions and projects intended to support early career researchers in South Africa and the wider region.